This is a view of my South Fidalgo Island neighborhood from the summit of Mount Erie looking southeast. I come up here every once in a while to take this same picture. I keep hoping to find a moment when the air is free of haze. This one from June is one of the best. When it is very clear, it is possible to see Mount Rainier from here more than 100 miles/161 km away. But not this day. The closer body of water is Lake Campbell. Beyond is Skagit Bay, the northern-most reach of Puget Sound. The bay is bounded on the left by Fidalgo Island and on the right is Whidbey Island. 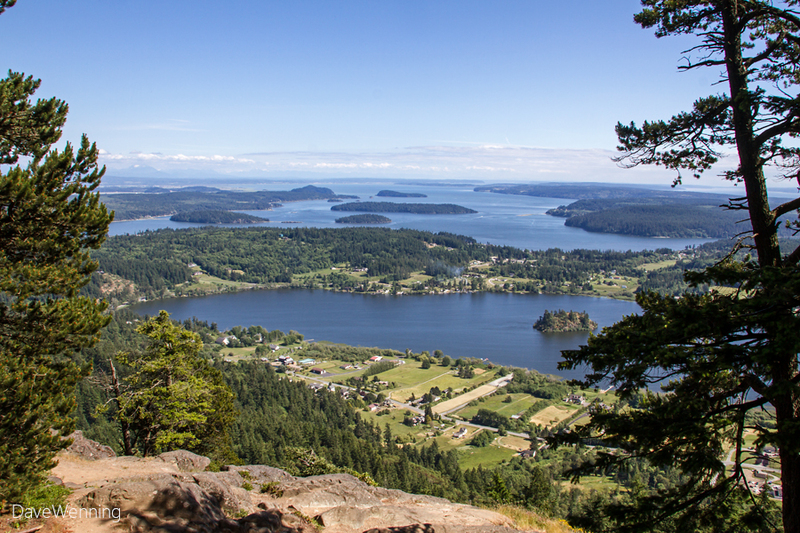 The small islands in the bay, left-to-right, front-to-back are Kiket, Skagit, Hope and Goat Islands. Does anyone know if the little island in Lake Campbell has a name? Great view, looks like a lot of nature. Beautiful capture and skies!! I've visited Fidalgo when I lived in Seattle and found it to be such a lovely place!! Thanks for sharing, Dave! Have a great weekend! I think you are very creative to go back and go back and try to take the same photograph. Very scenic area. WOW, amazing view. Thanks for sharing. Looks amazingly clear to me! !